Wellcome Witnesses to Contemporary Medicine, vol. 61. London: Queen Mary University of London. 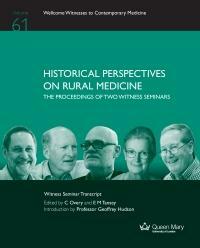 Introduced by Professor Geoffrey Hudson, this volume comprises edited transcripts of two Witness Seminars held in 2010 and 2015 on the history and development of rural medicine. Participants in London and others world-wide contributing via video link, addressed the development of the curriculum for teaching rural and remote medicine; the importance of community involvement; and the growth of national and international networks and organizations. Discussion also included: the impact of specialization; professional identity and status; the relationship to other health professions; technological developments; and the challenges of isolation. From mid-March 2017 this volume can be ordered from www.amazon.co.uk; www.amazon.com; and all good booksellers for £7.50/$10 plus postage, using the ISBN. For further details of this and other volumes in the series visit: http://www.histmodbiomed.org/article/wellcome-witnesses-volumes. All volumes are freely available to download.